Subway Chicken Orchard Salad is a seasonal menu item at Subway. Last year, I found this wonderful chicken salad too late. I only had it once before it was taken off of the menu. 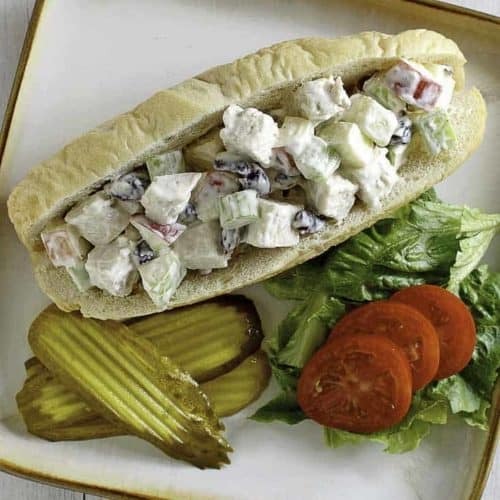 So this year when this chicken salad that is packed with apples, celery, chicken, and cherry infused cranberries, I made a beeline to Subway, and this recipe isn’t their top secret anymore. I took a couple of liberties with this recipe. They use only red apples, but I used one red, and one granny smith apple because I liked the flavor that the two apples gave. I also choose to use the cherry juice infused craisins. I thought they cherry added a little extra sweet touch. If you don’t have these available the regular ones will taste just as good. This recipe is made with light mayonnaise so we go a little lighter than using regular mayonnaise. This recipe would with regular mayonnaise as well, but I think it may be a little too heavy. This salad stays fresh in your refrigerator for several days. So you can make this before you are ready to serve. 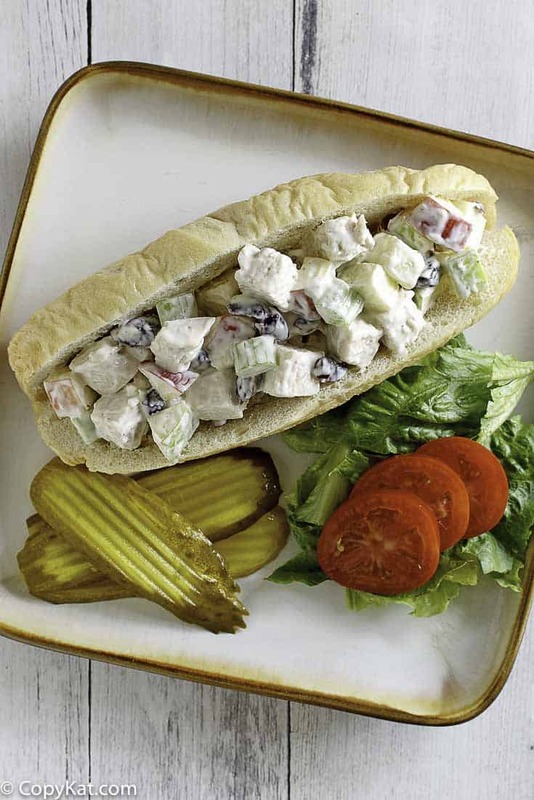 You can recreate the Subway Orchard Chicken Salad with this easy copycat recipe. Chop both apples into small cubes, and place into a bowl. Sprinkle over 1 tablespoon of lemon juice over apples, this will help them from turning brown. Add chopped chicken, chopped celery, and craisins. Mix well. Add 1 cup of light mayonnaise, and stir well. Depending on how the salad is coated, you may want to add an additional 1/2 cup of light mayonnaise. Season with salt and pepper. Allow flavors to marry in the refrigerator in a covered container for about an hour before serving.After making this recipe a few times, I added some toasted almond slivers to this salad, and thought the almond slivers added a really nice touch. I work at subway and you forgot the white raisins. I’m gonna try it with walnuts too. Our subway salad had golden raisins in it too. I made this and it was delicious! I used a red delcious apple & a granny smith apple and used the juice from a whole lemon to prevent darkening. Thought it needed more cherry infused craisins so I probably used 3/4 cup. Instead of almonds, I used toasted pecans.. This salad tasted better the next day. This was better than SUBWAY! I bet your salad is very tasty with pecans! This was really good in a cressent roll, yum! My local Subway’s has grapes in it’s OCS, never has had raisins. Perhaps it is the location, D/FW TX. This is one recipe I will try, Ty for sharing! I had this Subway sandwich on Sat Jun 4, 2011 and enjoyed it on Omega 3 grain bread at the Hollywood Bowl, Star Wars in Concert. (I had no idea it was a temporary sandwich, but just found out from my sister that she went to lunch today, 6-13-11 and it’s no longer avail… it was just a “seasonal” sandwich. Glad to see that this COPYKAT recipe very closely mimics it. I’ll be definitely making this at home. (as someone suggested, might add some walnuts to it as well). I love your recipies…love this salad but you guys need to do a friendlier print version. Four pages for a 1 page recipe is a waste of my paper. I responded to you via email, but didn’t hear back from you. This is a video I put together so people could print easily. THIS LOOKS GOOD. KEEP UP THE GOOD WORK U HAVE THE BEST WEB ON THE AIR….. Thanks so much 😉 I do taste the recipes too 😉 Thanks for the lovely compliment. I grew up eating this salad and still love it. My mother always made it with chicken, celery, apples, grapes, walnuts, and mayo. Great job! I can’t wait to make it! Yum!